Stay Connected with Our Monitoring Feature! When a comment is made, our monitoring team will email you alerting you there is a comment you need to respond to. If it is something we can easily respond to, we will enter a response for you. Otherwise, you can simply respond to the email with what you'd like to say back and we will post the comment for you! 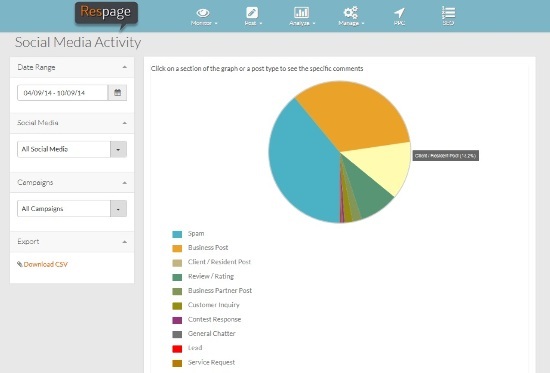 Alternatively, you can log into Respage Express and respond to the comment yourself. Each comment is scored in a category such as Service Request, Lead, Review/Rating or Client Comment. You will then be able to see exactly how residents are using each social media platform to communicate with the company.